On 2 June 2011 a beacon of freedom, justice and human rights was extinguished with the passing of South African freedom fighter - Albertina Sisulu. The anti-apartheid activist died in her home in Johannesburg after bravely fighting for decades to restore respect for human rights and human dignity in South Africa at a time when nonwhite South Africans were targeted and oppressed by immoral and unjust laws in their own country. Albertina Sisulu was among those who led a popular uprising against what will be remembered as one of the world's most ruthless, immoral and discriminatory regimes. Nelson Mandela is widely known and celebrated as the South African who led the liberation struggle against apartheid, but the icon clearly did not work alone. He fought for freedom along side relatively less known "comrades" and freedom fighters like Albertina Sisulu and her late husband Walter Sisulu. It is worth mentioning that the passing of Albertina Sisulu comes at a time when I am reading a book, titled Long Walk to Freedom: The Autobiography of Nelson Mandela - which captures in great detail some the immoral laws which Albertina Sisulu and other anti-apartheid activists stood up against. In his book, Mandela repeatedly mentions "the Sisulus'" - referring to Albertina and her husband Walter Sisulu. Mandela recalls how their home was his home. [Long Walk To Freedom: The Autobiography of Nelson Mandela, page 88]. This is how I came to know about the fallen icon. The Separate Representation of Workers Act which abolished the representation of "Coloureds" (what is known today as "people of colour") in parliament. The Prohibition of Mixed Marriage Act which prohibited interracial marriages. The Immorality Act which outlawed sexual relations between whites and nonwhites. The Population Registration Act which classified South Africans by race. The Group Areas Act which required different racial groups to live in separate urban areas. [Source: Long Walk To Freedom. The Autobiography of Nelson Mandela, page 98-99]. In 1956, Albertina Sisulu and other women marched against the infamous Pass Laws Act which was designed to limit the movement of nonwhites in South Africa and enacted in 1952. She braved imprisonment, house arrest and other forms of persecution by the repressive minority regime. [Source]. [Source]. In Nelson Mandela's emotional speech read by his wife on 11 June 2011 at the funeral of Albertina Sisulu in Orlando Stadium, Soweto, and published by the Nelson Mandela Foundation, Mandela referred to Albertina as "one of the greatest South Africans" who "provided leadership and exercised power with quiet dignity." Albertina Sisulu evidently promoted and bravely defended, at great personal risk, respect for human rights and freedom for all South Africans irrespective of race or color. Her passing leaves a vacuum in a world faced with a growing need for more heroes and heroines to continue the struggle for justice and human dignity around world. 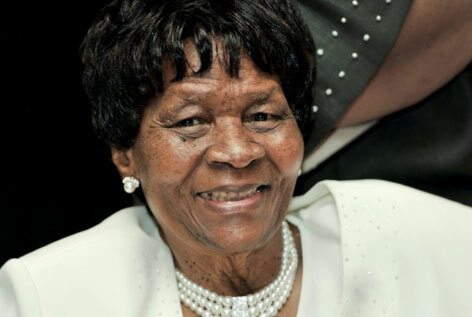 Albertina Sisulu, 92-year-old former member of parliament, leaves the world a better place. Hi, Nice to see a pretty professionally done blog on the this rich subject, now i want to see more on this blog, so when will your next post coming.